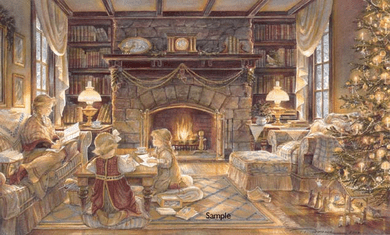 Trisha Romance Hand Signed and Numbered Limited Edition Giclee:"Christmas At The Cottage"
Artist Statement: "One Christmas while our home was undergoing restoration, we decided to escape and celebrate Christmas at a special place we call "The Cottage". The most important decorations came with us, along with of course the entire manger scene! In spite of being away from home, we were determined to make this experience a memorable one! It wasn't until Christmas cards began to arrive with "tidings of comfort and joy" that all seemed well with our souls. Each and every card or newsletter is like sharing a brief visit. Nothing puts one into the spirit of writing Christmas cards like the joy of receiving one!